A college student’s first assignment is due even before classes start - transforming the impersonal, plain dorm room into a stylish reflection of the student’s personality. For some, this is a welcome challenge; a chance to show off their creative sides and create a space that feels like home. For others, this can be an overwhelming and bothersome task. These tips should help lessen the burden of turning a cold room into one that is inviting and personal. If you can take a tour of your campus before moving in, do it. 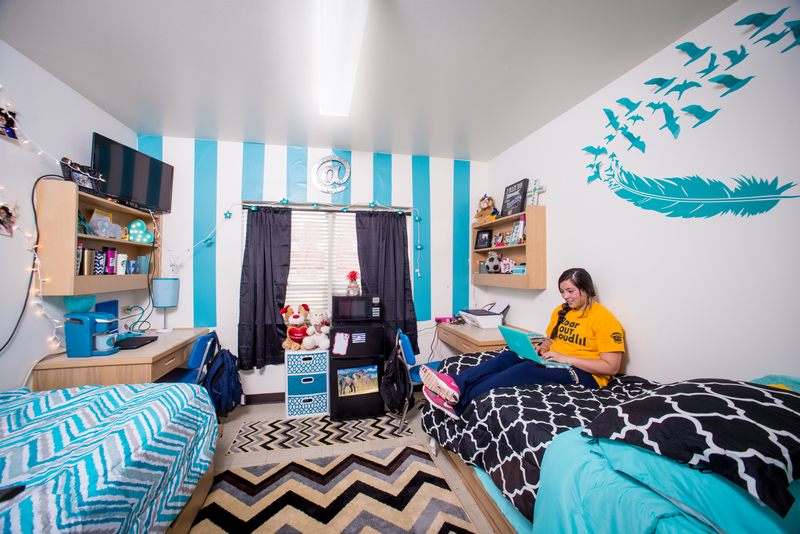 You’ll get a feel for the campus life as well as get a peek at the dorm rooms. Examine the rooms closely and make note of what they have to offer. Most dorm rooms will have a bed, a desk, and a dresser - the basic necessities. Others may also include a closet or bookshelf. If you are unable to tour your campus and look at the dorm rooms yourself, do a search online for your college’s basic dorm room. You should be able to find out exactly what the dorm room will have in it. Before you start packing, consider which items you’ll really need. It’s tempting to take every piece of art or decor from your own room and figure out a way to cram everything in once you get there. This will most likely result in wasted storage and space. Figure out which items and pieces mean the most to you and bring those. You’re most likely going to purchase or acquire new photos, art, and decorations once you get there, so be sure to leave some space for new things. Planning is key when it comes to decorating a dorm room. If you have a roommate, try to coordinate with him or her. Find out what he or she is already planning on bringing, so you don’t double up on unnecessary pieces of furniture or rugs. Once you finally get to your dorm room, you’ll probably want to unpack everything immediately, which can result in a mess and frustration. Start with the essentials, like bedding and electronics. Using bread clips to identify which plug or cord goes where will help later on when the room is full of furniture and more electronics. Washi tape is a great, temporary way to decorate. Use it on shelves or to hang photos or simply create wall art. Always follow the rules and regulations of the school when it comes to decorating your dorm room. Most schools don’t allow anything to be nailed to the walls or have anything cover the smoke detector or overhead lights. 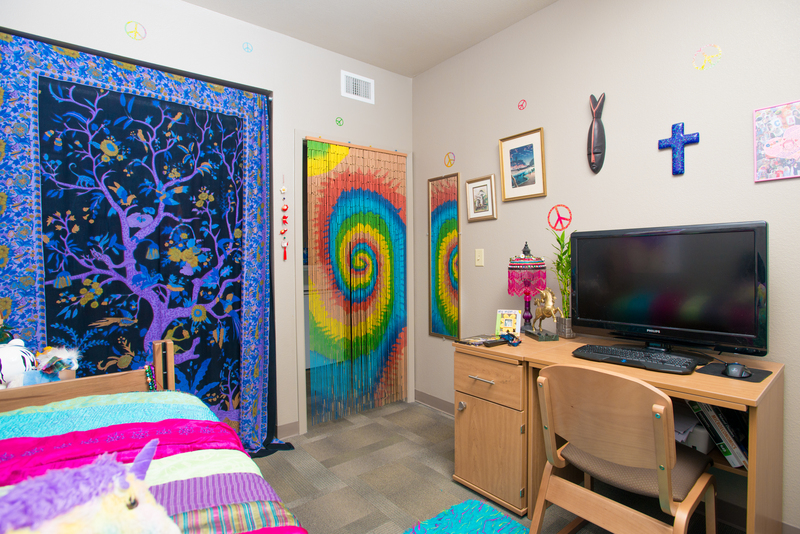 Rugs and tapestries are great for enhancing a dorm room. A rug can make a dorm room look less like a cell and more like a home. Tapestries hanging on walls can make a room look bigger, creating an inviting space in which you and your friends can relax. When it comes to storage, there’s definitely a shortage in dorm rooms. Using risers to lift the bed up will help alleviate this by allowing you to store containers or boxes under the bed. Using a laundry bag instead of a basket is not only easier to carry, but it is also easier to hang or hide out of the way when friends are over. Compartmentalize drawers by using decorated silverware trays or small baskets. You’ll be able to keep your room organized and clean much easier.